More than 80 people, including children, have been killed after a truck slammed through a crowd celebrating Bastille Day in the southern French city of Nice. The driver ploughed on for 1.2 miles on the Promenade des Anglais at about 23:00 local time on July 14, before being shot dead by police. Witnesses say the speeding truck swerved and zigzagged in an apparent attempt to hit more people. Police reportedly found guns and grenades inside the lorry. France’s President Francois Hollande said the attack was of “an undeniable terrorist nature”. PM Manuel Valls has declared three days of national mourning for the victims from July 16. A state of emergency, in place since November’s Paris attacks carried out by ISIS, in which 130 people died, has been extended by three months. The attack in Nice began shortly after the end of a firework display on the seafront for Bastille Day, which is the country’s national holiday. 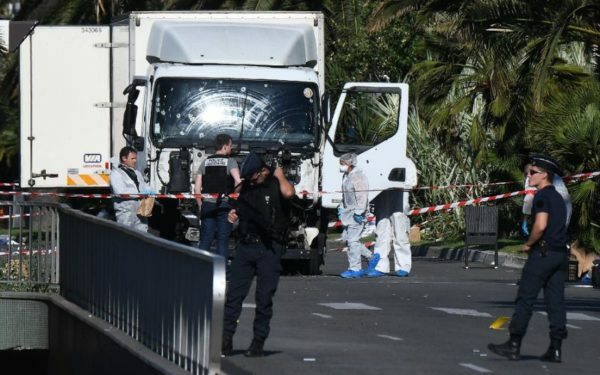 A white truck, the front of which was riddled with bullet holes, continued to be examined by police in Nice on July 15. A journalist with the Nice Matin newspaper reported from the scene that there was “a lot of blood”. According to officials, 84 people died in the attack and about 50 people have been injured, 18 of them critically. Nice Mayor Christian Estrosi has told local media that about 10 children were among those killed. No group has so far said it was behind the attack; prosecutors said the inquiry would be handled by anti-terror investigators. According to AFP news agency, the identity papers of a 31-year-old French-Tunisian were found in the truck, citing an unnamed police source. Local media reports named the man as Mohamed Lahouaiej Bouhlel, but his identity has not yet been confirmed. President Francois Hollande addressed the nation on July 15 saying France had been “badly hit” but was strong, adding “we need to do everything we can to fight against” such attacks. “All of France is under the threat of Islamic terrorism,” he said. Francois Hollande added that “operational reserves” would be deployed to support the army and security forces across the country, with particular focus on the borders. Manuel Valls said later that the goal of terrorists was to “instill fear and panic”. “But France is a great country and a great democracy that will not allow itself to be destabilized,” he said. President Barack Obama condemned “in the strongest terms” what he said appeared to be “a horrific terrorist attack in Nice”. Nice’s jazz festival has been cancelled and the southern city of Marseille has announced it is canceling a fireworks show planned to take place on Friday evening.